You are currently browsing the tag archive for the ‘Palmeiras’ tag. Here’s a nice little idea to encourage people to go to football matches, courtesy of the the Museu de Futebol, already one of the best places to visit in São Paulo. Present your match ticket from any Paulista stadium at the door and get entry for only 2 reais. (Normal entry fee is 6 reais.) One game days, tickets will be sold for 4 reais. The museum is also making it easier to visit on game days. The museum is built into the Pacaembu stadium, home to Corinthians and where Santos and Palmeiras also play regularly. It is now going to open up until two hours before kick-off on game days. The museum is fantastic and well worth a visit, even if it does lack content in English. After months of speculation, Palmeiras are reportedly closing in on signing Juan Roman Riquelme. For the sake of both the player and the club I hope the deal doesn’t go through. Palmeiras will play in the second division this year but have also qualified for the Copa Libertadores. They need a big squad with players who can perform over what will be a long and grueling campaign and who will stand up and be counted. 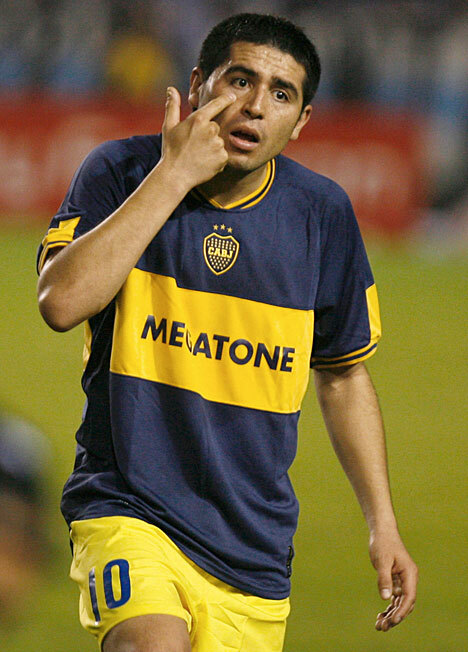 Riquelme is 34 and hasn’t played professional football since July when he fell out with Boca Juniors. He is clearly not a player who will be able, much less willing given his attitude over the years, to put his heart and soul into every game. He has a history of clashing with teammates and managers throughout his glorious career. He is certainly not a player you build your team around. Not because he isn’t talented. Fewer Argentines have shown as much deftness with a ball at their feet that mercurial No. 10. But Palmeiras need a leader, with experience, character and stamina. That the club’s directors think Riquelme is that man goes a long way to explaining how they’ve driven the club into the ground over the last 10 years. Fluminense won their fourth Brazilian league title on Sunday and this piece explains why. In short, two men were outstanding. Fred finished the season as top goalscorer with 19 goals, and more than half of them ensured Flu took all three points. His goals were decisive in 10 games. Goalkeeper Diego Cavalieri couldn’t establish himself as first choice at Palmeiras or Liverpool, where Marcos and Pepe Reina were No. 1, respectively. But he was fantastic for Fluminense, keeping 13 clean sheets over the season and making countless great saves. A team wins the league, not individuals but they were two of the best performers over the season. Congratulations to Fluminense who will now want to emulate Corinthians and win the Libertadores for the first time. If players like Deco, Rafael Sobis and Thiago Neves turn it on like they’ve turned it on before then they are in with a real chance. See O Globo’s photo essay on Flu’s triumph here. Common sense prevailed today in the case of the Palmeiras handball goal. Judges with the Supreme Tribunal of Sports Justice (see their decision here) ruled that the referee was right to disallow the illegal goal and confirmed the 2-1 victory for Internacional stands. Palmeiras were losing the Brazilian championship match on Oct. 27 when Argentine striker Hernan Barcos punched the ball into the net to apparently level the score. The referee originally disallowed the goal but back-tracked amid furious protests from Internacional players, delaying the match for five minutes. Palmeiras claimed the fourth official had been told of the handball by a colleague who watched a replay. Barcos didn’t deny punching the ball into the net, although he alleged it was not deliberate. But Palmeiras argued that match officials chalked the goal off only after seeing it on television replays, which would violate FIFA’s rules. Palmeiras are almost certain to be relegated for the second time in 10 years. They currently lie third bottom of the league and are seven points behind the team fifth from bottom with four games left to play. Four teams go down. Here’s a cool idea from Brazil. Rather than suspend football players for fouls, handballs and ungentlemanly conduct, authorities here are making them do community service. It’s a novel ‘punishment’ for players who all too often abuse their role model status. Among those receiving alternative sentences in recent months are Sao Paulo and Brazil striker Luis Fabiano, Palmeiras’ Chilean midfielder Valdivia and troublesome Corinthians striker Emerson Sheik. Valdivia was ordered to spend his 10,000 real fine for insulting a referee on food and other aid for an orphanage in Rio de Janeiro while Luis Fabiano was sentenced to visit a rehabilitation centre for handicapped children. Emerson yesterday visited children being treated for cancer. All declared the experience enlightening. “This type of visit is educational as well as being punitive,” said Flavio Zveiter, who heads the court that metes out punishment to footballers in Brazil. Zveiter said he was moved after seeing Luis Fabiano interact with the disadvantaged kids and vowed to hand out more alternative punishments in the future. The policy sometimes works and sometimes doesn’t. Emerson, the man who played such a huge part in helping Corinthians win the Copa Libertadores earlier this year, turned up almost three hours late to see kids at the Graacc hospital. Authorities might want to reinstate his ban. Turning up three hours late for a meeting is a total lack of respect under any circumstances. For children with cancer it’s an outrage. Brazil has approved 54 cities to host national teams during the 2014 World Cup. It’s a preliminary list that should rise to closer to 100 by the end of the year. The cities must have at least one FIFA-standard hotel and at least one FIFA-standard football pitch. Teams will base themselves there for the group stages of the tournament, and from there fly or drive to games. That’s why 30 of the 54 are close to Sao Paulo, Rio de Janeiro and Belo Horizonte, each of which will host at least six matches. Japan, England, Australia, Holland and the United States are among those nations who have sent representatives to scope out potential bases. See the official FIFA document with all the approved areas here. The Brazilian teams still in the Libertadores and Copa do Brasil have adopted the same strategy as every year, saving the best players for the midweek games and playing their reserves in the league. Both Santos and Corinthians are getting exactly what they deserve for such stupid, short-sighted and insulting policies. After four games, Corinthians are bottom of the table with 1 point and Santos are just above them with 3 points. The clubs still in the Copa do Brasil playing semi-reserve teams are doing almost as badly. Palmeiras are second bottom of the table and Coritiba are in 14th place. Only Sao Paulo in seventh and Gremio – in third after defeating Corinthians (reserves) yesterday – are anywhere like they should be. The policy is stupid because resting top players for league games doesn’t make these teams any more likely to triumph in the Libertadores. It’s short-sighted because giving up on so many points at the start of the season will inevitably cost them any chances of league success later on. And it’s insulting to players because it presumes they can’t perform to the best of their abilities twice in a week and to fans, who are asked to pay to see sub-standard line ups. Pele used to play more games in a season than any player does today. Lionel Messi and Cristiano Ronaldo play twice a week and seem to do just fine. Players in England, Germany, France and Italy all play high profile, energy sapping league matches at the weekend and Champions league fixtures during the week. Supporters deserve better. They’re not daft. Yesterday’s crowd to see Santos (reserves) play Sao Paulo (reserves)? 6,327.